New Delhi: All four accused in the Samjhauta Express blast case have been acquitted by a local court in Haryana. The four accused are Swami Aseemanand, Kamal Chauhan, Rajinder Chaudhary and Lokesh Sharma. Chauhan, Chaudhary and Sharma are lodged in Ambala’s Central Jail, while Aseemanand has been out on bail since 2015. 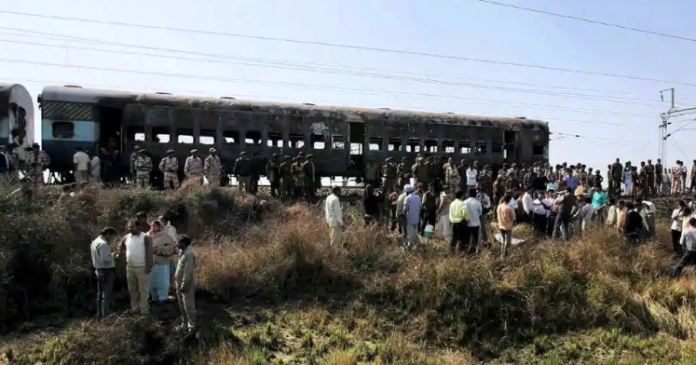 An IED blast rocked the bi-weekly train near Panipat, Haryana on 18 February 2007 and killed 68 people from both India and Pakistan. The first FIR was filed by the Haryana Police, which had also constituted a Special Investigation Team (SIT). The matter was transferred to the Central Bureau of Investigation (CBI) before the home ministry in July 2010 transferred the case to the National Investigation Agency (NIA). The premier probe agency accused eight people, however, only four faced trial. Of the remaining four, one (Sunil Joshi) died in 2007, while the other three (Amit Chouhan, Ramchandra Kalsangra and Sandeep Dange) were declared proclaimed offenders. Swami Aseemanand is the main accused in the case. In its chargesheet, the NIA said that Aseemanand was the main ideological support behind this operation. He is alleged to have given financial and logistical support as well. The NIA filed its first chargesheet in June 2011. Subsequently, two supplementary chargesheets were filed in August 2012 and June 2013. According to the NIA, the blast was a criminal conspiracy aimed to threaten the “unity, integrity, security and sovereignty” of India. In the eternal whataboutery that marks India – Pakistan relations, this will give them an opportunity to blunt the edge of criticism that the 26 / 11 trial is going nowhere.